Heroes come in all shapes and sizes, but they don’t come much bigger than Mike Mignola’s most famous creation, the Red Right Hand of Doom, Hellboy. The one time “face” of the B.P.R.D., he’s the bright red, hell-born monster slaying machine who, when the things that go bump in the night strike, bumps back harder and makes them rethink their life and career choices. While he was a mainstay in the fight against evil for more than half a century, in nineteen fifty six he was sent to Mexico on assignment and shortly after arriving went missing for five months. 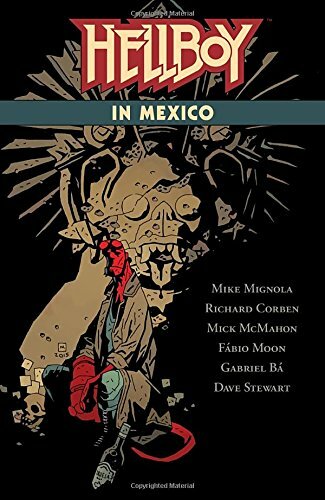 Hellboy in Mexico is the story of what happened to him, and what he did, during those five months. So strap yourselves in and get ready to head south of the border, because in these pages, things, as they tend to do in Big Red’s world, turn every shade, and a few more in-between, of weird, wonderful and crazy.